The RD-1006Z improves on the classic RD-1006 with a new and improved material. The New RD1006Z Discwasher Wet System Vinyl Record Care System easily removes dust, dirt and fingerprints from your vinyl records. This system includes a vinyl record cleaning pad, mini dust brush, cleaning solution and storage pouch and is ideal for use with all vinyl records. 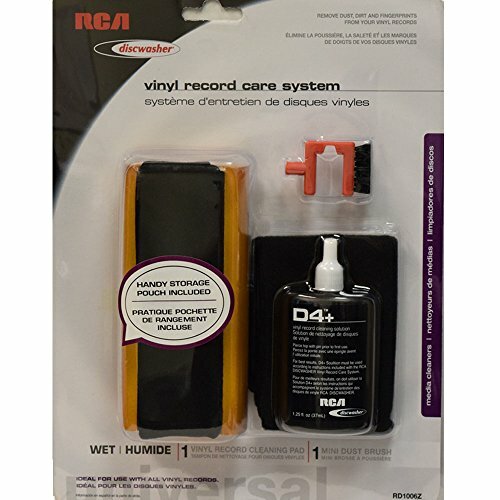 Unique microfiber pad and D4+ fluid safely removes dust and dirt from record surface without scratching. Includes vinyl record cleaning pad, mini dust brush, cleaning solution and storage pouch. Removes dust, dirt and fingerprints. Ideal for use with all vinyl records.